Great that you could make it again. First off, I meant to post this back in June. After our first Google paycheck this was our second big milestone. Cool huh? And the first day we ever ran any traffic was Saturday 30th April, so in just two months! Anyways, last week Jake gave you a great run-through of some of the AdSense optimisations while I was in France at a music festival on a beach! Pretty sweet, but this week’s it’s all business again for me, and I’m excited to tell you about some strategies we’ve been using to hone our content. Once you’ve got your content up and campaign running maybe, like us, you’ve been inclined to just leave it? We’ve found we can squeeze a lot more juice out of our campaigns by going back and revising the copy and the slideshow order. How do we do it? Like everything, it’s the stats! So listen up. Article Content/Subjects Adsense keywords Include well paid keywords This one! Slideshow ordering Post exit rates and time on site Keep users in slideshows/on site This one! 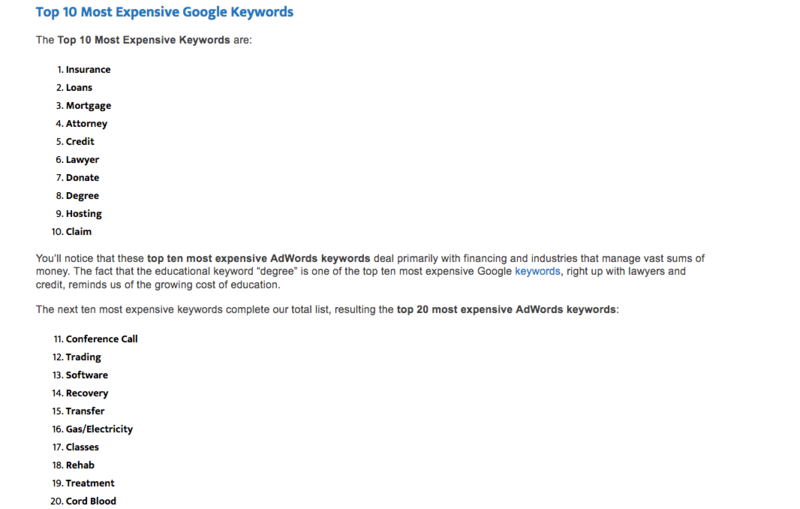 Google prices its AdSense keywords (“Adwords For Content”) differently for different topics. Have a look at these two links to see some of the most expensive. So an advertiser is likely to pay more if they are advertising insurance (#1) than if they are advertising a rehab centre (#18). (Pity the fool who offers both!). Now, as publishers, you and I get paid the amount the advertiser bid to have that ad displayed (minus Google’s slice of the pie), so we get paid more for insurance-based ads than rehab-based ones. 3. Making the Most Of It? So, to make more money, we can focus on writing stories that are likely to contain high-paying keywords and therefore be populated with higher-paying ads. Does it work? From our experience, yes! 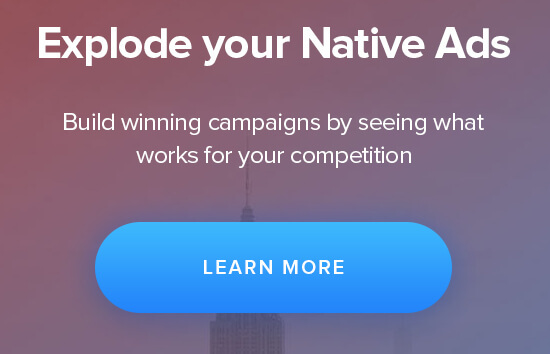 Our best performing campaign, which has basically generated all of our profits – I think Native Ad Buzz Rob says in his book that you only need one successful campaign, it’s just about finding it! – happens to be about air travel and holidays. Well, that’s not on those top 20 lists, I hear you say, but after running the campaign for a few weeks and looking at what ad categories were performing well for us (see below) we clocked that we could still try to squeeze in a couple more references to insurance, loans, credit cards etc. by revising our copy. The outcome? 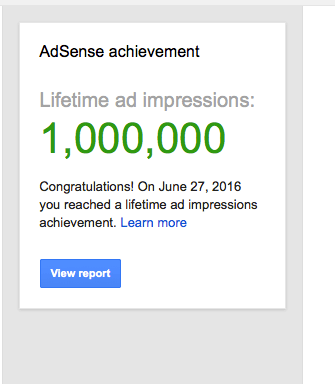 By making a few tweaks here and there, we managed to shift our average AdSense CPCs up. It might have been by cents rather than dollars, but over tens of thousands of clicks, those add up! How much you can use this approach of tailoring your content to high-paying topics depends on the niche of your site. But it’s worth reviewing these lists (just Google “adsense keywords” and there’s a bunch of articles) simply to get to understand what sort of keywords pay the most. Are you as big a fan of the Velvet Underground as me? This is one of my favourite tracks of theirs: and the message chimes with one of our aims, to get our readers to stick with us (as far through a slideshow as possible, and beyond)! Retargeting is something we’re only just starting to do, but it’s ****ing powerful and sticky readers, the one’s who love clicking through and clicking through and clicking through…. are precisely the ones we want to retarget! Once we started a campaign we looked to see how people were actually engaging with our content – how far they were clicking through it – and noticed some alarming trends! When we started running the travel-based campaign I just mentioned, in the opening sentence of the opening slide we had references to “The Don”. Having run the ad campaign on Outbrain for a few days we got around to looking at the exit stats and were shocked! When we looked at the exit rate for this first slide it was high – 64%! Instead of reading the article, or clicking on ads, they were just closing leaving our site straight away! We revised the opening sentence by removing the reference to our beloved Don, ran the traffic the following day, and the result? Same CPC, same headlines, images…. the exit rate dropped off to 43%. More people in front of ads for longer: we get more money. We saw similar things with other slides. Some slides had massive exit rates! shifting the “bad performing” slides to the end of the slideshow (and good ones to the front). Theses changes improved the average overall session length of the slideshow. To examine the exit rates and see which slides need to be tweaked go into Analytics and go to Behaviour>Site Content>Exit Pages. I tend to then sort by Pageviews (so you have the most hit pages at the top, which should follow the numbering of your slideshow) and then check for pages with high/low % Exits and move those to the end/start of your slideshow and/or look at the slide and see if you can improve it by reducing text or changing the picture. Our target is to get slide one under 50% and all others under 10–12%, which we’ve found we can do. Simples! Other strategies you can use to keep users until the end of a slideshow? Here’s one that Rob from Native Ad Buzz taught us when he was mentoring us early on: put the picture you use in your Outbrain ad at end of the slideshow to keep people clicking through until the end (to play on the human craving to “complete the circle”).. .. or don’t include it all! Anyways, fire your questions at us in the comments, and hope you have a great week!